Except sometimes; when we can adjust the way we come to understand events. When most people think of ‘justice’ today, it’s usually personal, whereas the ancient scales of Justice were created to apply to the society as a whole. “Justice” as a concept was originally created to directly affect how people chose to act in everyday life. 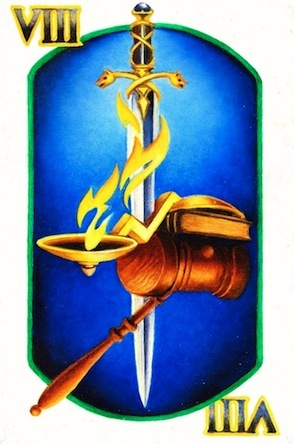 In the symbol above, “we’ are the blade and it is ‘we’ who are caught between the rule of Law and the twisted scales of long-dead Justice’. Since the planet left the tracks of sanity so long ago, the general population has been reluctantly rediscovering why we used to live with established norms: Now that we’ve discovered that every sword tends to have a double-edged blade. For decades now we have been spitting on integrity in all its outworn forms. Those days are coming to an end. What they overlooked was the example which Hitler set (for today’s would-be-conquerors) when he murdered his Black Shirts, once they were no longer needed. Instead of murdering ISIS, ISIL and the dozens upon dozens of rival gangs including especially the resurging Nazi’s that have been so useful in creating chaos almost everywhere: It now appears that it is far too late to try and stop them now, especially on or near the borders of Russia today. All it will take to lite the nuclear fuse for WWIII is exactly what the Nazi’s have always done, in every conflict they have entered: They wear the gear and show up as whatever they want to blame: Then they fire on both sides until the real fight begins. The problem this time is that what is at stake is the potential end of the world if they succeed in baiting Russia and USI to attack each other on Russian borders ­ why else would USI-Israel, NATO, EU and the lame UN have allowed the addition of six more nations and armed them to go with the failed state of Ukraine that obviously failed in the task they were supposed to carry out in 2014? The one thing guaranteed to vanish in the multiple fireballs will be the hatreds that will definitely be replaced with global desolation and the end of humanity.